At midwinter, there is not much a beekeeper can do for her girls. Mostly, you wait for warmish days and use those times to check that there is enough to eat inside the hives. If the girls have been gluttonous, the beekeeper needs to take action to ensure they do not starve before the first flowers appear. Feeding bees at midwinter can be a tricky business: bees don't usually go for the sugar syrup we give them at other times of the year. One way to get them substitute food — still cane sugar — in a honey-like form is to make a substance called "fondant," or bee candy. At left, you can see a couple of ways of offering it to the bees: either in round cakes that you can place above the cluster of bees in the hive, or spread on frames (almost like honey!) and hung in a box above where the girls are grouped. Mary Ellen reported that she had tried both, and her bees went after it enthusiastically! MaryEllen is a pastry chef by trade, and she is a great person to figure out the quick and least failure-prone method to do anything. These pictures were therefore taken in her kitchen. She did not wish to be included in these photos, so I count it as a perverse success that you can at least see her hand and arm. 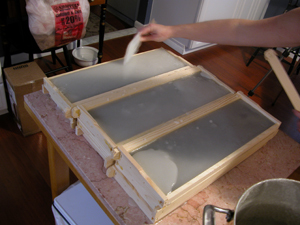 After the fondant has cooled, store it in plastic in a dry location. 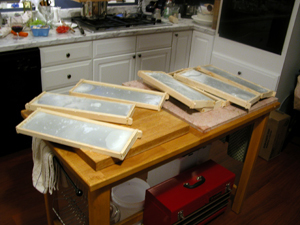 Later, I got an email from MaryEllen saying that she had been busily recycling the scraps of sugar (pools on the counter tops, crumblies that fell off cakes and frames as they cooled) into a follow-on batch for her bees. She wrote "I wanted to tell you that if you don’t make too much, it goes well in the Kitchen-Aid stand mixer! Since it beats for some time (longer with more vinegar btw) I got the entire kitchen cleaned up while the mixer was just working away on slow. One thing to note — start out with the bowl down (ed. 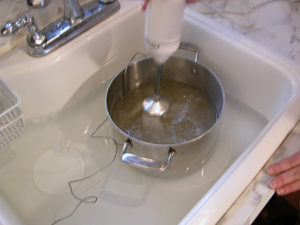 note: if you have one of those full-scale stand mixers with the adjustable bowl) when you turn the motor on — and then raise it up slowly to prevent splashing molten sugar all over the place. Fortunately I thought of this before I had any character building experience." We originally made the fondant on November 29, 2005, but December was too cold for major bee manipulation. 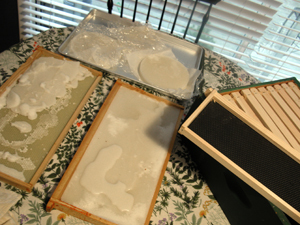 Therefore, the frames were only put on Wilde (the Carniolan colony) in early January. When I opened up the colony a couple of days later, the bees were all over the candy. Chef tested, honeybee approved!